For the last two years I have tried valiantly to convince my sister and brother-in-law to move their family to Texas. They would of course have to adjust to the heat and learn how to trap lizards under Tupperware containers, but those negatives hardly outweigh the massive positive: living close enough to us that we could all have dinner together. On a whim, and without having to drive or fly hundreds of miles. Our kids could play together on the weekends and after school, or better yet, our kids could attend the same schools. But here's the deal, Texas. 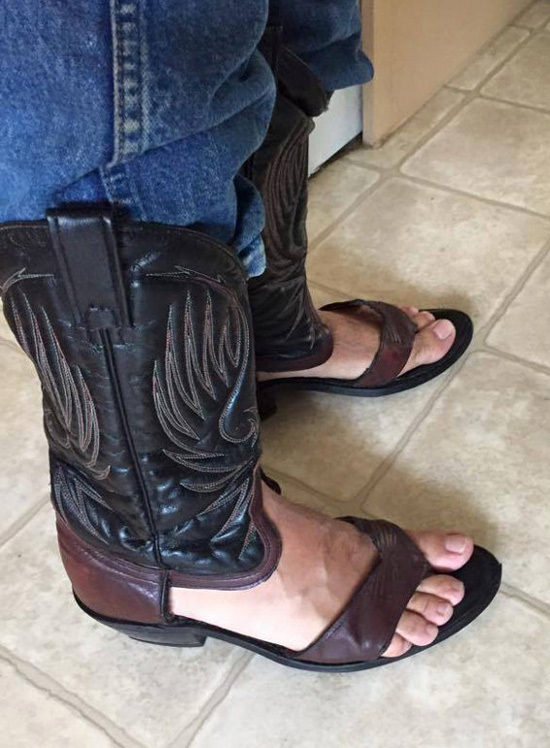 As long as we're wearing boots - or sandals - like these, Sara and Jeff won't touch Texas with a 10-foot pole. Texas friends, are these for real? If so, what are they called? Sanoots? Bandals? Boodals? 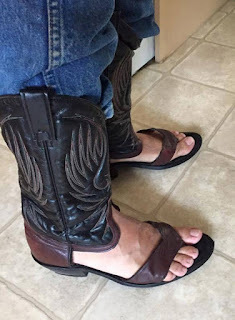 There's probably not a good name for this (lack of) style of footwear, just like there's probably not a good reason for them to ever see the light of day.